China is building strategic long-range missile trains as part of its major nuclear forces buildup, according to new information from China and U.S. strategic specialists. Chinese state-run television recently broadcast a program monitored in Taiwan that disclosed new details of the People’s Liberation Army (PLA) rail basing system for ICBMs, including the possibility of a rail-mobile launcher. The program was uncovered and translated by Georgetown University’s Asian Arms Control Project. Meanwhile, the U.S. Air Force recently sought proposals from the U.S. defense industry for a future U.S. rail-mobile ICBM that would be hidden in tunnels. According to an analysis of the Chinese television program, China already has deployed strategic missile trains as part of a nuclear forces tunnel and basing system that until recently was a closely guarded secret. Video released by the Chinese shows the strategic missile train disguised as a military passenger train with windows, but hollowed out for holding China’s new long-range missiles, known as DF-31 and DF-31A systems. Those systems are currently deployed on road-mobile launchers. The program revealed that the Chinese are building between 620 miles and 1,240 miles of special rail tracks capable of handling the heavy ballistic missile trains. Pentagon spokesmen declined to comment on reports of Chinese railing mobile missiles, stating that information on the weapons is secret. Phillip Karber, a former arms control official who started the Georgetown arms project, said if China deploys rail-mobile missile forces over the next decade, it will pose "major questions for American strategy and arms control policy." "The combination of mobile-road/rail ICBMs with [multiple, independently-targetable reentry vehicles] deployed in underground tunnel complexes produces compounded entropy over time," Karber said. "At first, a few experimental units may not mean much, but the longer they are secretly deployed, the greater our uncertainty on the numbers and the implications." Karber said he shares concerns of arms control specialists who are critical of the U.S. government for not providing more public details about China's rail-based nuclear missiles. "The open source material we have seen are like the shadows flickering on Plato's cave—ominous but also prone to exaggeration," he said. "Eventually we are going to need to have a serious discussion of the strategic and arms control implications of China's strategic tunneling and rail-based ICBMs. But without more information it’s likely to produce more heat than light." The Georgetown arms project triggered controversy last year by scooping the U.S. intelligence community in an assessment of China’s underground nuclear facilities, dubbed the Underground Great Wall. Regarding U.S. missile trains, the U.S. Air Force Nuclear Weapons Center earlier this month published a proposal for the defense industry seeking ideas for modernizing U.S. ground-based strategic missiles. The proposal stated that one option is to look at rail-mobile "tunnel concept." "The tunnel concept mode operates similar to a subway system but with only a single transporter/launcher and missile dedicated to a given tunnel," the Air Force said. "The vehicle moves at random down the length of the tunnel. The tunnel is long enough to improve survivability but leaving enough room to permit adequate ‘rattle space’ in the event of an enemy attack." The missile tunnel diameter would be large enough to fit a missile and mobile launcher described as "self-propelled, unmanned cars [that] can move via rail or in a ‘trackless’ configuration." Chinese rail basing of nuclear missiles also was disclosed by the former head of Russian strategic nuclear forces, retired Col. Gen. Viktor Yesin, during a visit to Washington. Yesin said Russian intelligence had details of the Chinese rail basing system that appears to resemble the Soviet Union’s SS-24 rail-mobile nuclear missile force, the only such rail based ICBM in the world. That system was taken out of service between 2000 and 2008. Yesin told a forum on Capitol Hill that Soviet SS-24s were hidden in specially hardened railway spurs to avoid detection and targeting by the United States. During the visit, Yesin told the conference that Russia believes the Chinese rail-mobile missile system is more reliant on the system of some 3,000 miles of tunnels for the rail-mobile missile. "We are underestimating Chinese military power," Yesin said in an interview last month explaining the rationale behind the nuclear buildup. "And China has very ambitious tasks. China has the goal of catching up with the U.S. on GDP by 2025, 2030." Karber said the U.S. military in the past considered a rail basing system for Minuteman ICBMs and the Air Force recently sought ideas from the defense industry for a rail- and tunnel-based ICBM system. However, "the American military has had no operational experience with deployed rail-based missile systems," Karber said. Pressure from American arms control advocates in the past dissuaded the United States from deploying rail-mobile ICBMs based on concerns that the combination of hard-to-locate rail mobility and multiple warheads was regarded as potentially destabilizing. Yesin said in December that Russia strengthened 6,200 miles of rail lines with stronger gauge track to support the heavier ICBM rail cars and allow them to launch the missiles from trains that were moved around the country. 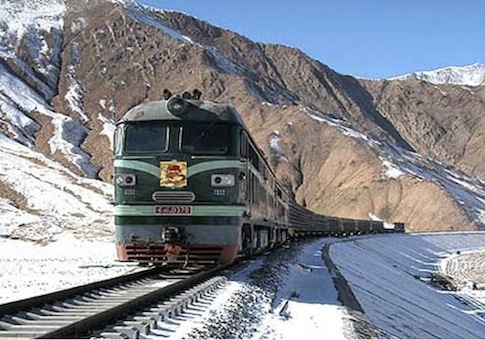 Chinese military commentators have stated in recent years that China is currently converting up to 1,200 miles of track for heavy missile trains. Chinese state-controlled media also have said the Chinese military’s missile train is built on a Ukrainian design and technology transfer. Yesin, in the Capitol Hill speech, confirmed that the SS-24 was designed in the Ukraine during the Soviet Union. He noted close similarities between the SS-24 and video and photos of the Chinese missile train. Video footage obtained from official Chinese television also reveals missiles being loaded horizontally through the ends of rail cars even though the railcars had retractable roofs indicating possible launcher capabilities. Yesin said Russian assessments are that the end-loading was an attempt to avoid damage to the car and missile while loading. Disclosure of the rail-mobile missile system comes amid reports that China also is developing MIRV warheads for its growing ICBM force. Russian SS-24s carried up to 10 warheads each. Each SS-24 train carried three missile launch cars and the total force of at least 12 trains for a total of up to 360 nuclear warheads capable of hitting the United States. Georgetown students with the Asian Arms Control Project translated details of the Chinese reports of the missile train. According to a Taiwanese television analysis of the CCTV report, the Chinese missile train is a "formidable" strategic weapon. "This missile train is of very high importance," one Taiwanese commentator said. "So the Party has already made 1,000 to 2,000 kilometers of track for it. Also, it can reach speeds of between 100 and 200 kilometers per hour, so this is the nuclear train’s most terrifying feature." Such mobile ICBMs are considered destabilizing to the strategic nuclear balance because they are hard to locate, can be set up quickly, and are able to be launched rapidly with little or no warning. Richard Fisher, a China military affairs expert, said the United States should also be concerned by signs that Moscow is planning to revive its rail-mobile ICBM program. "I would expect that Russia would be designing new systems that could more easily handle new lighter solid-fueled ICBMs, a direction that might also interest the PLA," China’s military, Fisher said. "Given the PLA's interest in ‘leap ahead’ technologies, they might even be considering how to adopt their new high speed trains to the deployment of ICBMs." This entry was posted in National Security and tagged China, Russia. Bookmark the permalink.